Body brushing is one of the most effective ways of seeing results and getting skin in peak condition quickly. Brushing skin for just a few minutes each day can make a big difference to skin health, revealing luminous, softer, and more toned skin. Voya’s new exfoliating body brush is a beautiful natural bristle brush and gives skin an invigorating workout, getting the lymph system moving and helping to disperse any trapped toxins without being too harsh. 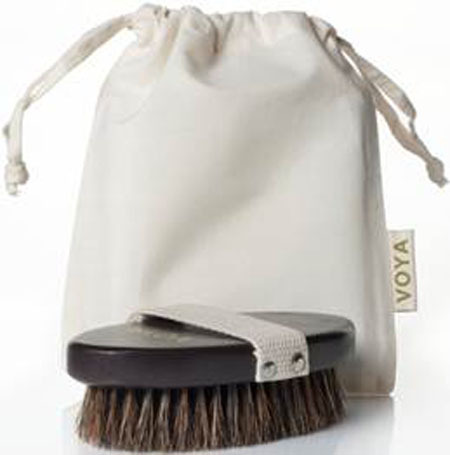 It comes in an organic cotton bag and so is ideal for continuing daily brushing on the go. Body brushing should be done before showering, on dry skin. Beginning at the toes, work upwards on the legs in long, firm strokes, working towards the back of thighs and bum to keep cellulite at bay. Brush the stomach in an anti-clockwise movement to aid digestion, and continue up the arms towards the heart. The massaging action of VOYA’s exfoliating body brush stimulates blood flow, bringing nutrients and oxygen to the surface of the skin. Complete your body routine by massaging Voya’s Softly Does It body moisturiser into still damp skin to lock in moisture and keep skin wonderfully hydrated.